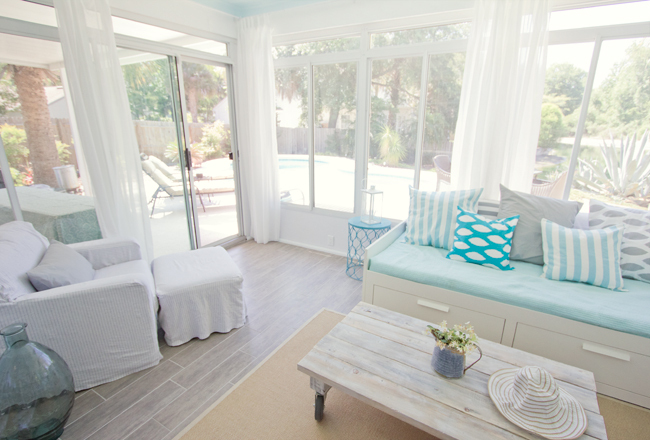 Have you ever seen a more striking, turquoiselicious sunroom?! It is my pleasure to introduce you to Jenna Sue. 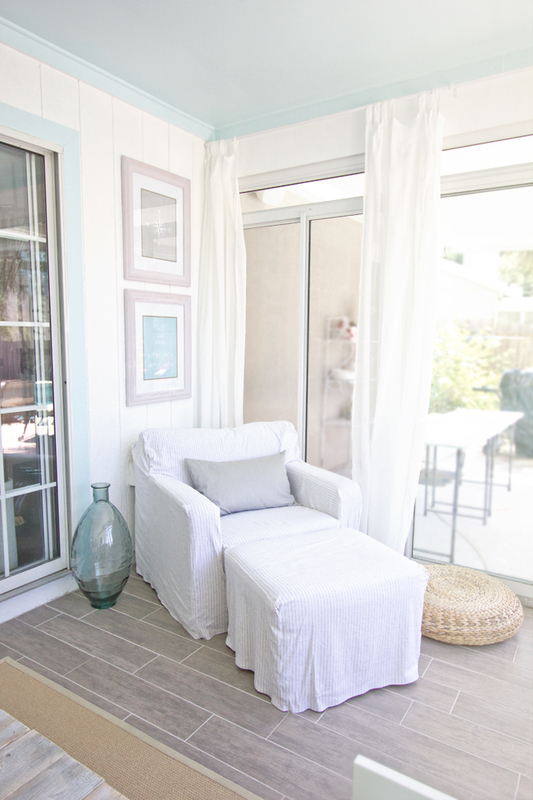 Together with her husband Brad, they have spent the last 5 weeks tirelessly working on their Jacksonville, Florida sunroom and documenting all of their DIY projects and construction phases on her incredibly inspiring blog. 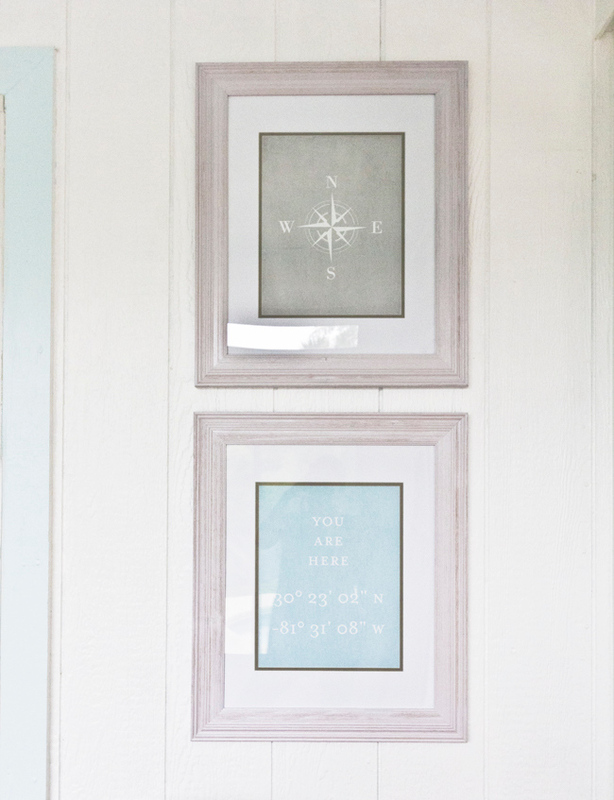 When she’s not doing amazing remodels, Jenna runs Jenna Sue Design Co.–a custom print design shop filled with super cute personalized art (as seen above!). So we know she’s got some major talent! 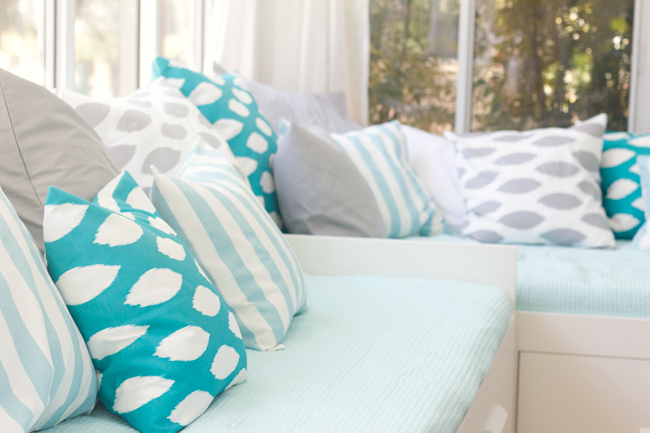 You do not want to miss out on the rest of her home either, it’s sprinkled with our favorite color all throughout! 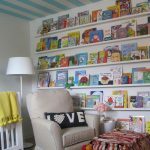 Visit her blog to see more fab photos of this space, including the always-fun ‘before’ shots! 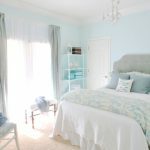 When I saw this on her blog, I immediately thought she should send her pics to you. Love it! Wow, absolutely stunning images. Dreamy, fresh, gorgeous. I want to be there RIGHT NOW!! Completely gorgeous in every way! 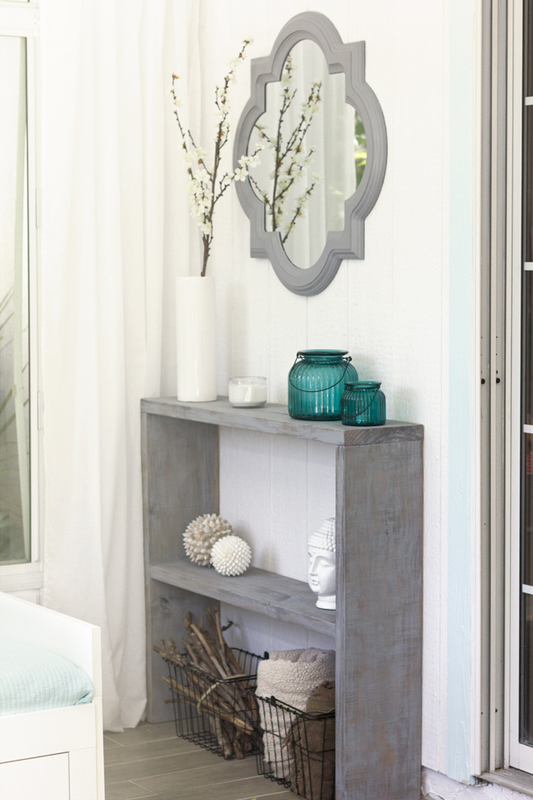 Oh wow – this must be on the most fresh and calm interiors I have seen! Sooo soothing! I really love the beach feel of this design. It looks really good. 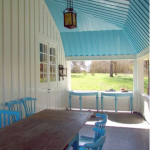 This is a great sunroom. Bet it feels cool even in the heat of the day. 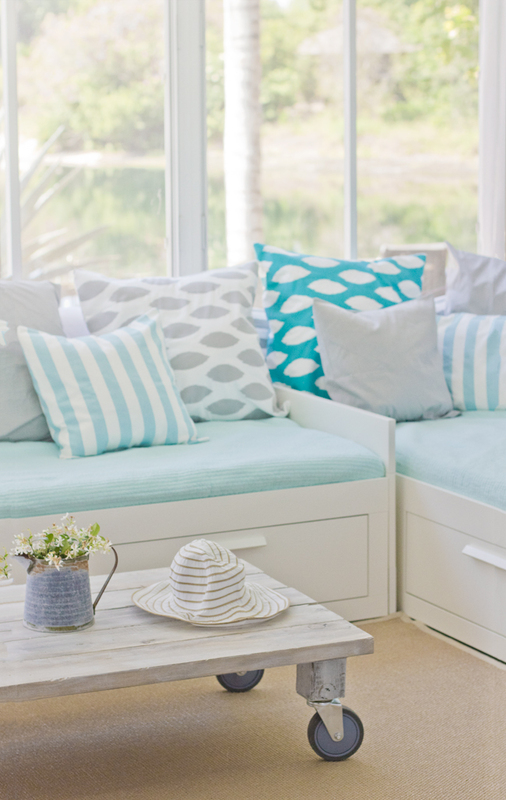 What a good idea to use beds as couches and snuggle them together. Always ready for guests! I REALLY need to go buy some paint! Love this, simply pretty. Thanks for sharing a new blog to check out too. Wow that cat looks like my old cat that passed away last year! And she's a gorgeous contrast to the soothing colors! I love the clean lines and simplicity of the design and of course the color!! Wow! This is one of the best website for getting idea about decoration. All types of decoration ideas with stylish home accessories available here..
That coffee table…i must have it!!! you can move it anywhere easily for an impromptu party!! Love this space. 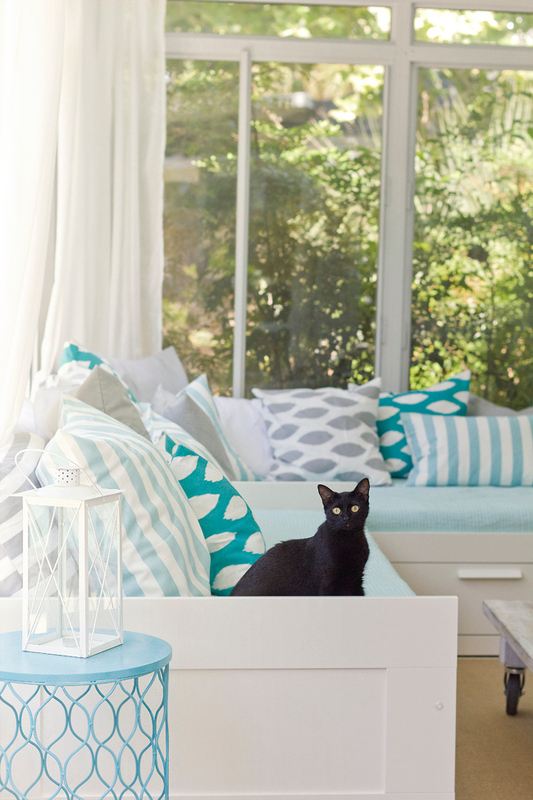 The bright turquoise against the white and greige is beautiful. Looks like you could really relax here. I did that same side table in a cabin project this spring. Wasn't it fun to spray paint?!? Where did you find the trash can that you turned into an end table?? 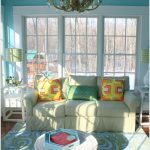 Gorgeous sunroom and love the fact that you have listed where the items are from. 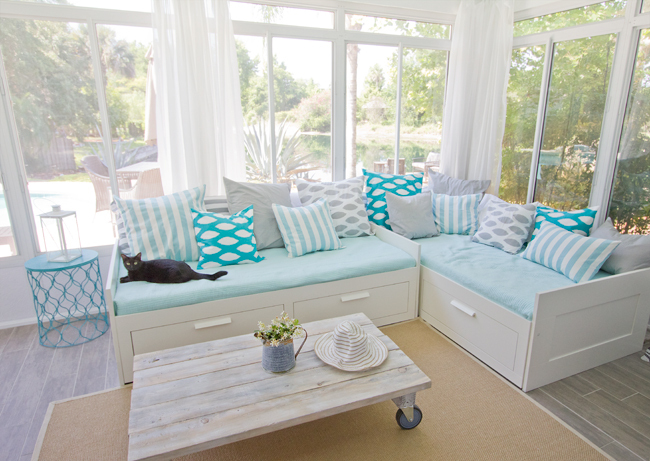 Was planning to use the ikea daybeds for my sunroom but was wondering if placing them in L shape without the corner seat that comes with a sectional would make it look odd in person. 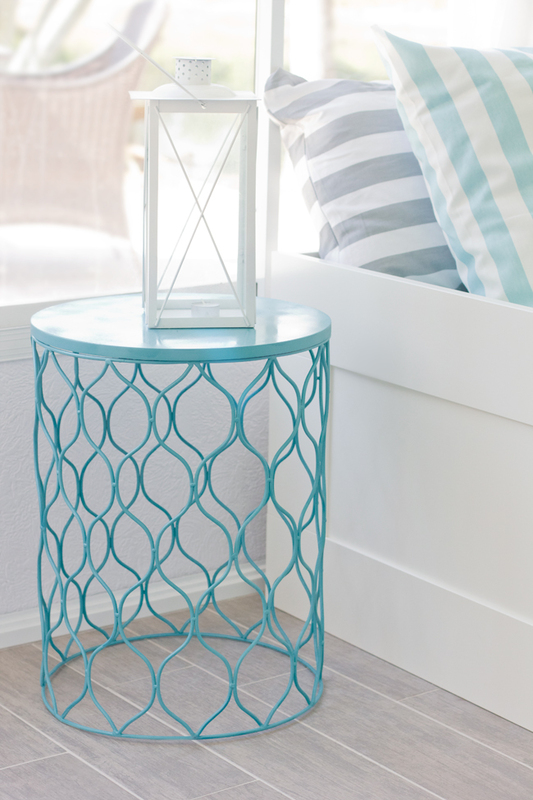 The link to that side table at Target doesn't work…does anyone know where to get the side table painted blue? What a fun idea! I am sharing this on Pinterest.